This coat of arms tapestry "Love Strength Courage" shows a royal crest, from the work of contemporary artist Bob Bergin. Striking in detail and color, we see a heraldic crest with lions that symbolize courage , and acorns symbolising strength. The Latin words seen in the crest "Amor Est Vitae Essentia" translates to literally "love is the essence of life" and is the third virtue represented here. The intricate details of the feathered tufts, the acanthus leaves, the lion's manes and bodies and the subtle patterned background to the crest creates a work that is refined and polished. Family crests and royal crests have been around since the medieval period and have literally been used by families to symbolise their names and their virtues. Now in today's world, many family crests are created to represent virtues, such as these ones here in this tapestry, to decorate homes with not just beauty but representations of these virtues as well. 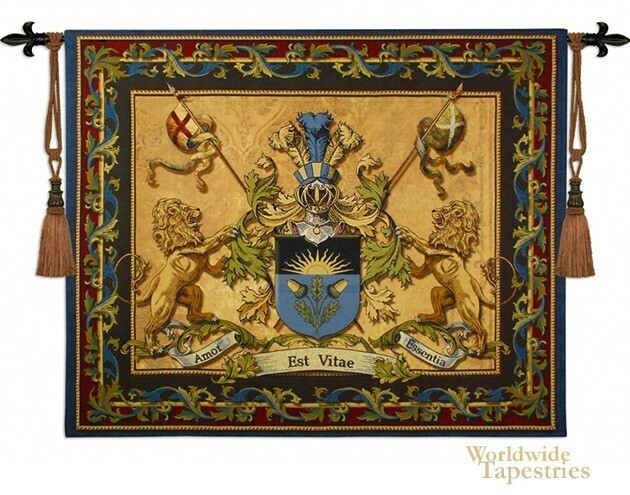 This coat of arms tapestry "Love Strength Courage" is backed with a lining and has a tunnel for ease of hanging. Note: tapestry rod and tassels, where pictured, are purchased separately. Dimensions: W 64" x H 53"